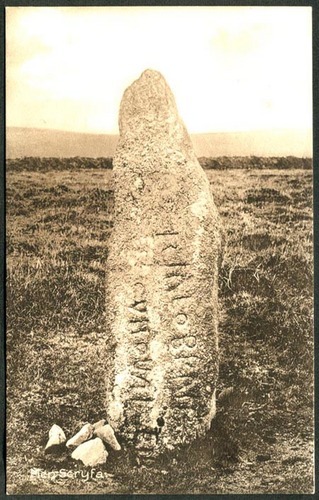 The Mên Scryfa lies a short distance above the Mên-an-Tol and was mentioned by Cotton in 18271 as being prostrate on the ground, until set upright by Captain Giddy in 1824, who was obviously a very busy man that year. Redding2 describes the Mên Scryfa as being 9 feet 10 inches long, and 20 inches broad, though, above the ground, it is actually close to 6 feet high. It was described by William Hals and first sketched by William Jones, the travelling companion of Edward Lhuyd, in 1700, while the stone was still prostrate. 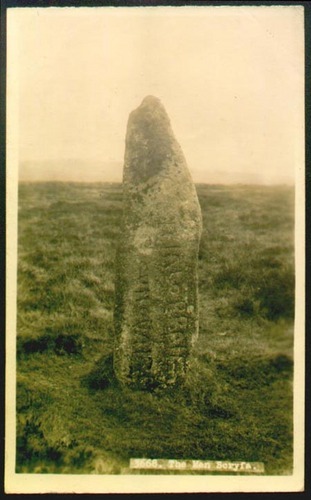 The Mên Scryfa, meaning written-stone in Cornish, is included here due to the possibility of its being a prehistoric menhir, with the inscribed memorial added at a much later date. J T Blight, in A Week at the Land's End, writes that "As an ancient inscribed monument, it is one of the most important in the kingdom. The inscription is, "Rialobran-Cunoval Fil"; at length, "Rialobranus Cunovali Filius," signifying that Rialobran, the son of Cunoval, was buried here. It has never been ascertained who this Rialobran was. Rialoval, a British leader who lived in the year 454, and Rivallo (alias Rywathon) brother of Harold, the son of Earl Godwin, have been hinted at. The question is not now likely to be settled; and in a few years, most probably, the stone itself will be numbered amongst the things that were." It is a cause of celebration that Mr Blight's fears for the monument were unrealised. 1. Cotton, William. 1827. Illustrations of Stone Circles, Cromlehs and other remains of the aboriginal Britons in the West of Cornwall. J Moyes (2nd edition, Men-an-Tol Studio, 1998). 2. Redding, Cyrus. 1842. An Illustrated Itinerary of the County of Cornwall. How & Parsons.